Nature has clearly demonstrated that it is possible to harness solar energy through the process of photosynthesis and that the same light energy can be used by photosynthetic organisms to generate electrical current by combining those organisms with electrodes to form biological solar cells. These apparatuses are generically called bioelectrochemical systems (BESs), or biophotovoltaic (BPV) devices. The technology behind the BPV system used in this project was developed by Paolo Bombelli and his team at the University of Cambridge. 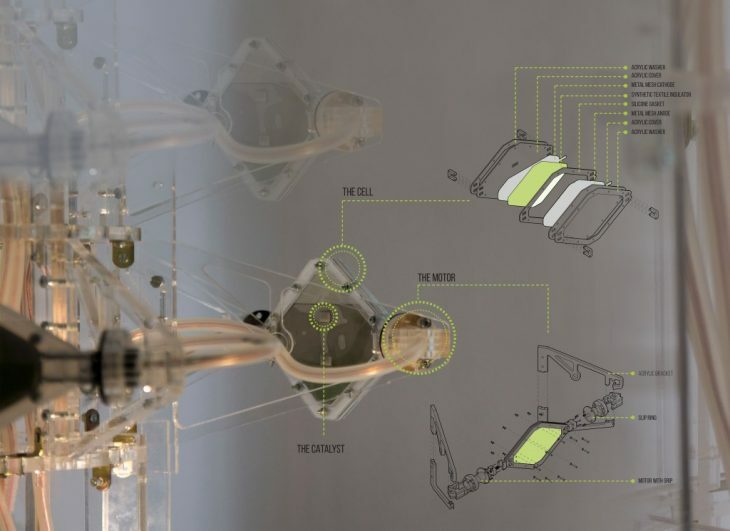 This project focused on using and adapting the biophotovoltaic film system to create an adaptive energy-sensing algae cell, harnessing this microorganism’s ability to harvest solar energy and generate electricity via the photosynthesis process. 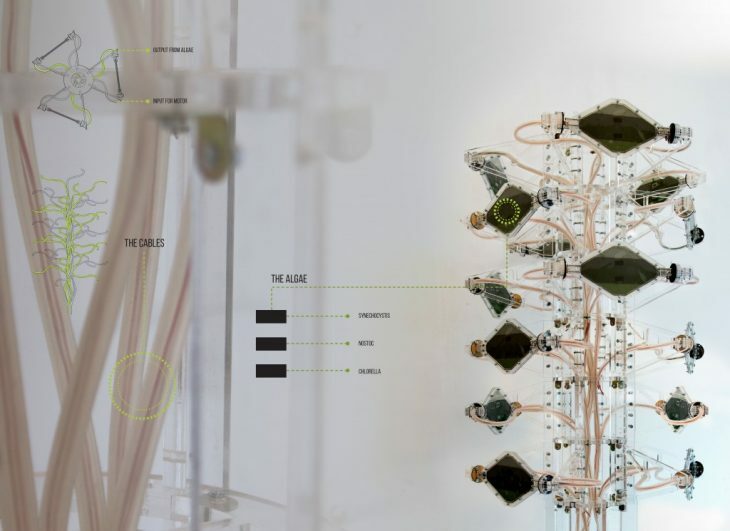 The cell panel rotates to agitate the algae and generates electricity through a network of conductive anode and cathode meshes with a carbon catalyst to transfer electrons from the cell surface to the electrode that harvests them. The structure lays out each panel in such a way as to maximize solar exposure without sun-bleaching the biofilms. 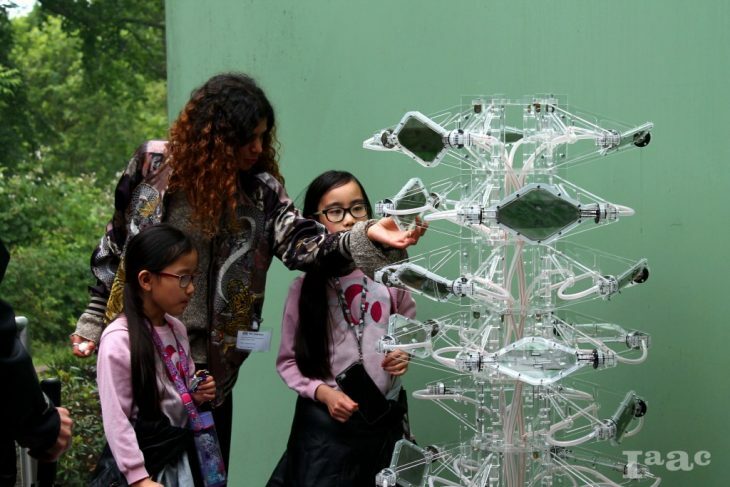 Through connected tubing within the transparent structure, the power output from this setup is able to sense the energy output and monitor different conditions in which algae can be energy generating. Vents which are located on each of the panels provide airflow to the algae to breathe. The holes of the vents are covered with a specific carbon paper that seal the holes and prevent spillage. The paper serves as a carbon catalyst that is glued on the internal side of the panel with the catalytic face facing outside.The non catalytic face of the cathode is in electrical contact with the stainless steel mesh and passes the electrons to the cathode. The motor plays an important role in spinning the panels and agitating the algae. The agitation serves to disperse the cells for more uniform growth and helps each cell to receive adequate sunlight. The electric cables are split into three clusters of five cells, where they serve as an energy collector for the three different testing areas and as an input to spin the motors. 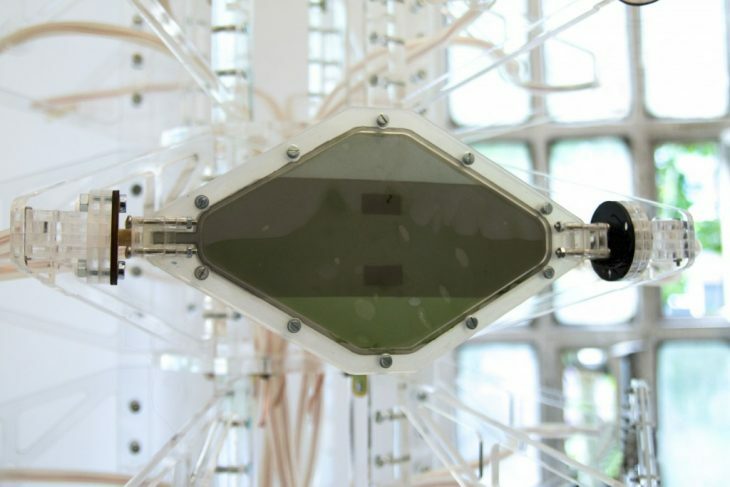 On the left side of the panel, the input current, to run the motors, is guided in parallel through the tubes and on the right side the electrical output from the algae is collected. This system has the ability to examine three different conditions for voltage output of the algae. 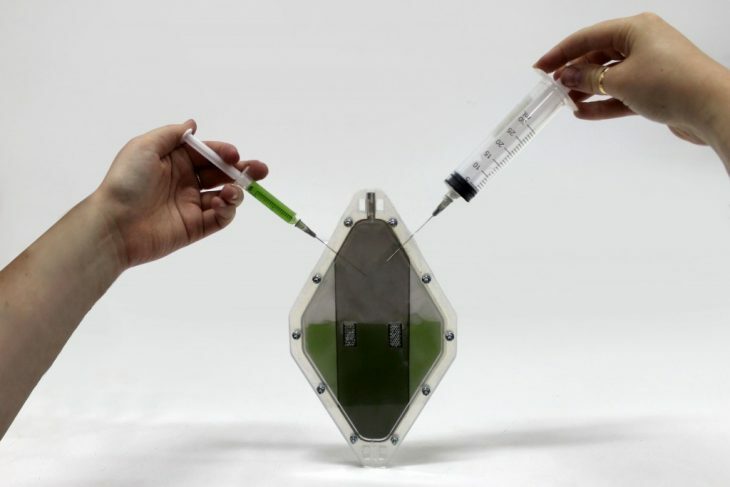 Using three different algae, here, (Synechocystis, Nostoc and Chlorella) each connected in series in their cluster, is able to give us information dependent on the different environmental conditions they are placed under.